We all love eating poutine. 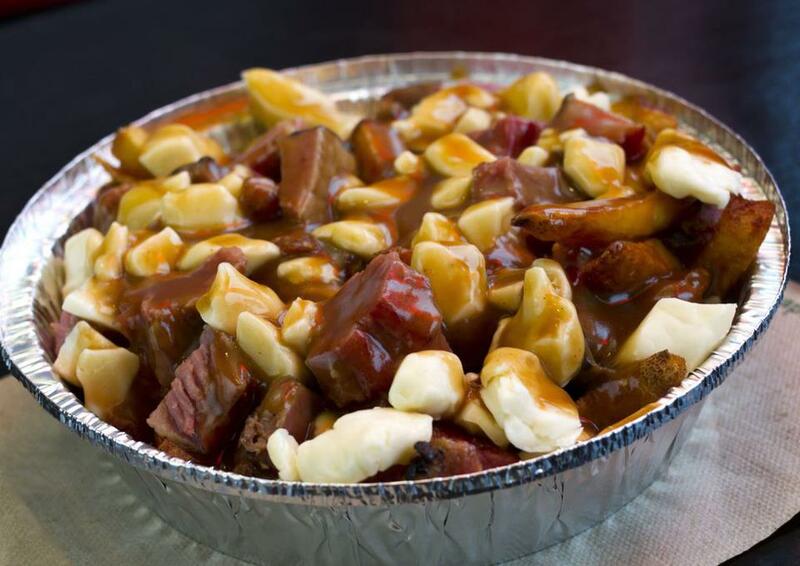 Read this article if you want to know where the best, mouth-watering poutine is in Vancouver. It’s so good, you may just think you’ve visited Montreal. Do not skip these magnificent creation if you’re craving poutine in Vancouver. Where are the best poutine in Vancouver? Try out these Vancouver poutine and let us know if you agree; they are the top 5 YVR poutine in our books! “The beautiful potato” as it’s known in French is as close a taste of Montreal poutine as you would get in Vancouver downtown (unless you’re willing to take a road trip to Langley for Estrella’s Montreal Deli). These gorgeous double fried fries are freshly cut, homemade, and crisply fried as a good poutine should. Now topped that with flavor packed gravy with real Quebec cheese curds; you have the best poutine in Vancouver. It’s not even a competition. La Belle Patate has a variety of poutine variations that you can try including smoke meat, chicken, BBQ, and Galvaude. When you visit, because I know you will after this picture, go for the traditional good old fashion traditional poutine then try their smoke meat poutine next. Living up to it’s name, this Canadian bistro serves some of the best Canadian poutine in Vancouver. The “Very Canadian Poutine” at Oakwood Canadian Bistro is only served during their dinner menu and comes to a price of $14 but it’s rather an irresistible dish. 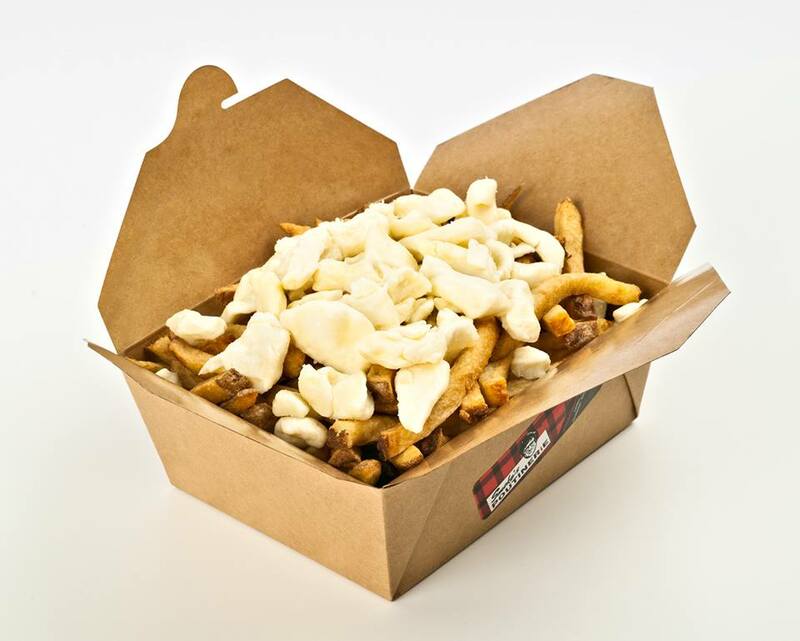 Freshly made fries is topped with house gravy and generous portions of smoked beef brisket and Quebec cheese curds. 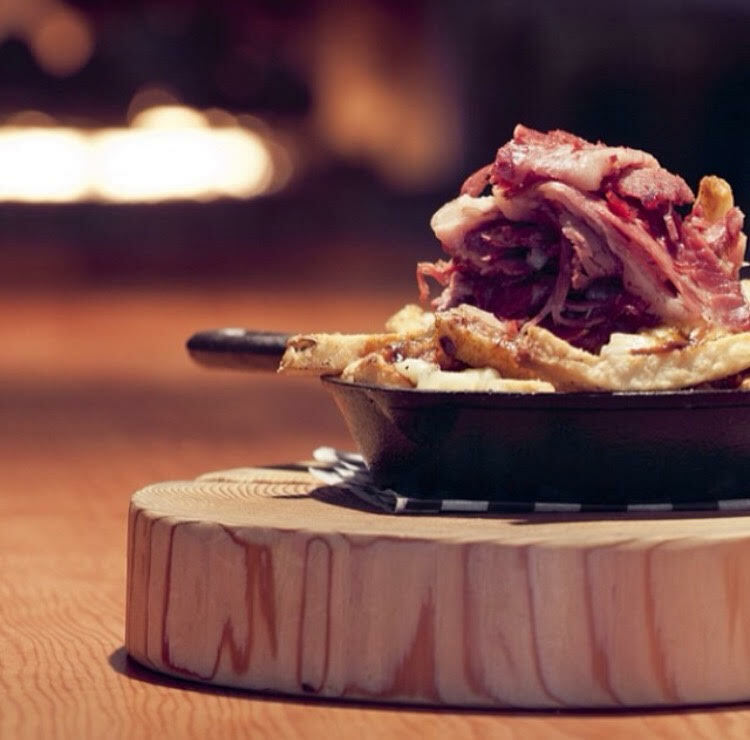 If you’re looking to taste the best poutine in Vancouver, Oakwood Canadian Bistro rightly comes justified at #2 with this artisan Canadian poutine creation. We’re placing this at #2 partly because of it’s delicious poutine and largely because we’re a fan of anything Canadian and local; which Oakwood Canadian Bistro fills both. Their other dishes are also equally a worthy try. Belgian Fries serves up two sizes for their poutine, medium and large. The prices at Belgian Fries run just under $10 for a medium sized premium poutine (like Chicken Kebab) and roughly $7.50 for their classic Vancouver poutine. The portions are reasonably sizable for a medium though a large is only roughly $1.50 more. Maybe visit with a friend, grab two different large poutines, and try a little bit of both; they have quite a few different poutines. While you’re there perhaps try out their deep fried mars bar too. Fritz European Fry House is known primary for their poutine. Who would have thought another European themed store would be serving up the best poutine in Vancouver. This family owned eatery is nicely nestled right in downtown Vancouver and patronized by both locals and tourists looking for good poutine in Vancouver. As with any good poutine, the fries are freshly fried and home-made. You have the thick brown gravy over-top with perfect Quebec cheese curds which soften without completely melting. That’s a good poutine. Fritz European Fry House can’t quite edge out Oakwood’s Very Canadian poutine but it’s a great value for any late night food escapes. Prices are fair, $5 for small, $7.5 for medium, and $10 for large. Their poutine menu is a la cart, you can add any additional toppings to your classic poutine ranging from Montreal smoke meat to crumbled bacon for an additional cost. They have a few specialty European dips such as “peanut sauce” or “dutch mayo”. It’s worth a try if you’re around the area; don’t go out of your way though. Fritz European Fry House is opened daily till at least 2 AM except Monday when it’s closed; 4:00 AM on Fridays and Saturdays. Smoke’s Poutinerie easily serves up some of the best Vancouver poutine. This seems to be a franchise (and being Vancouverites, we prefer family-owned, local businesses). This is true Canadian comfort food, with thinly cut, crisp fries, even better gravy, and cheese curds. Their cheese curds is good and their gravy is even better. They serve up a variety of flavors from pulled pork, chicken fajita, or their veggie delux. It’s one of the biggest poutine menu I’ve seen in Vancouver; Smoke”s Poutinerie only serves poutine. We’ll be replacing Smoke’s Poutinerie with Costco’s poutine shortly because honestly Costco poutine is closer to Canadian poutine and better value than Smoke’s Poutinerie. The franchise isn’t very well operated and hygiene can be a concern at Smoke’s Poutinerie by observation of their operations. Smoke’s Poutinerie is known for good poutine in Vancouver. More POUTINE! 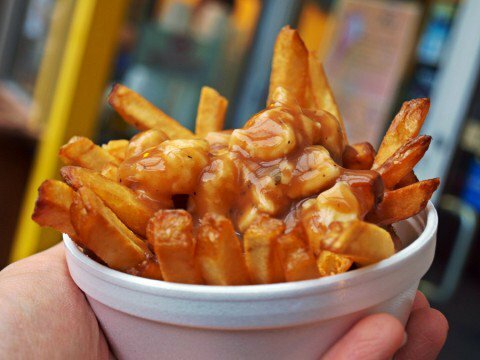 If you’re still craving for poutine, here are more worthy stores to try. They aren’t as the first five but equally worthwhile in a category of its own. Dunn’s Famous – Dunn’s Famous is known for smoke meat (which honestly, isn’t that great – not anything near Swartz in Montreal. It needs to be more meatier and peppered. Tastes like traditional corn beef or deli smoke meat at the moment.). Their smoke meat poutine is generously portioned for $8! Almost a 9″ circular container stuffed with fries, gravy, cheese curds and loaded with smoke meat crumbs. In essence, Dunn’s Famous has excellent value for their smoke meat poutine but could step up their game on the gravy and smoke meat aspect. This is highlighted for incredible value and portions. Overall, there are over 35 eateries in Vancouver that dish up this deliciousness called poutine (from the likes of restaurants like Chambar, pubs like Wolf and Hound, pizza franchises like Mega bite to good old food truck in Maple Ridge like Big Red’s Poutine – we Canadians love our poutine). We are confident these Vancouver poutine we’ve featured above are the five best poutine in Vancouver BC that you have to try if you’re craving poutine. Don’t let some stranger tell you where the best poutine is. 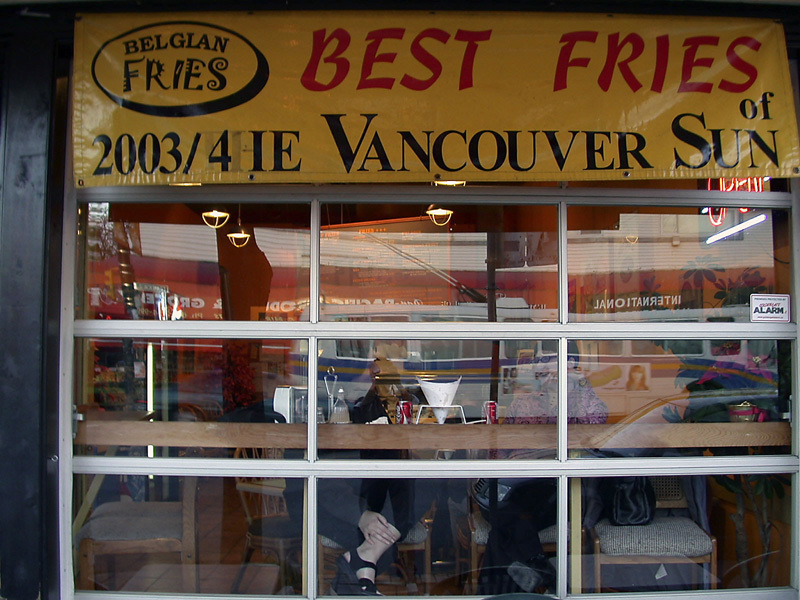 (This Buzzfeed article is completely off – since when is the best poutine in Vancouver…from a Belgium restaurant. Belgium Fries has some pretty mighty poutine but far from the best in Canada. This is like saying French Cuisine is better in Singapore.) On the other hand, these are the best poutine in Vancouver from a local’s perspective and local opinions. A few other poutine stores in Vancouver were not mentioned. If you’re looking for good value, and tasty poutine, your nearest costco could be a safe bet for good poutine at only $4.75. Since poutine is almost our national food, there’re quite a few options for poutine. Comment if we missed anything that should be on the top 5 list.